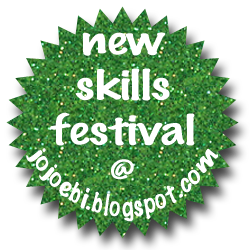 Today's new skills festival is bought to you be me! 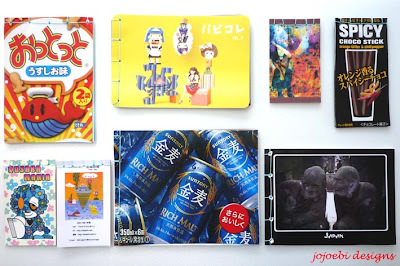 A while ago I shared with you some little books I had been making for Ebi-kun's writing box, he loves filling these books, we have several manuals and stories written already. Of course, it is easier just to go out and buy a pile of notebooks but I think the big difference is that with homemade books you can just add a few pages and because the child can complete the whole book there is a real sense of achievement. Cut the card and paper so they are all the same size, the size doesn't matter which is why these are so much fun to make. Take one of the pieces of card which will become the front cover and draw a line down the left hand side, 1cm from the edge. Now mark 1cm from the top and 1cm from the bottom. Take the scrap piece of paper and cut it so that it is the same length as the distance between the marks you have just made. 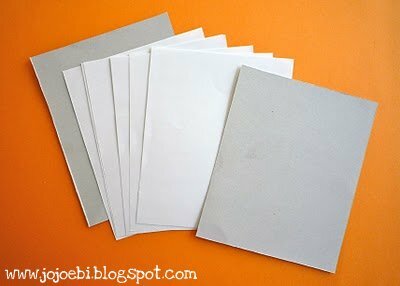 Fold the scrap in half and then half again, open it out, where the creases are will be the points for the middle holes, so use the scrap as a ruler and transfer the points onto the marked line. You now have 5 points marker, these will be the stitch holes. I have numbered the holes to make it easier with the explanation, you don't need to do it, unless you want to of course! Put all the paper in a neat pile and add the covers, make sure the edges are square then use an awl to push holes through the five marked points. Thread your needle and pull it from back to front through hole 2. Leave a tail of about 10cm. Hold onto the tail and make a stitch around the spine, bringing the needle through hole 2 from the back again. Take the needle from front to back through hole 3. Stitch around the spine going from front to back through hole 3 again. Bring the needle through hole 4 from the back to the front. Make a stitch to hole 5 from front to back. Make a stitch around the spine back through hole 5. Make a similar stitch to the spine stitch but this time around the bottom of the book, back through hole 5 from front to back. Bring the needle through hole 4 front back to front, then stitch to hole 3 from front to back. Bring the needle through hole 2 from the back and make a stitch to hole 1, from front to back. Make a stitch around the spine going back through hole 1. Make a similar stitch around the top going through hole 1 from front to back then push the needle through hole 2 from the back to the front. Flip the book over, do one final stitch around the spine through hole two and then tie off the ends. I like to add a dot of glue to the cut ends just to stop the knot from coming undone. That is is, decorate you book as you like or give it to the kids to work on. We have a mix of books, some with the plain side on the outside some with the printed side out. Old postcards are great for covers, inspiring for little ones to write about a trip they have been on. You can also play around with the types of paper you use and you can use wool or narrow ribbon to sew the binding with too.